As mentioned previously, I will be speaking to DASFA next month. This will be a 30-45 minute presentation about myself, my writing, my editing, and the Ephemeris RPG. I'm not really one for talking about myself a lot, so I'm already trying to put together some notes on some of the things I might want to say. More than anything, I'm hoping I don't put anyone to sleep, but I think I should have some interesting things to say. I'm finding Rebecca's pregnancy to be very tiring. Under normal circumstances, I (with some help from the girls) do quite a bit of the work around the house. I work at home, so it's just easier if I do it. However, since Rebecca has developed some seriously horrid morning sickness, I've taken on a lot more of the responsibilities. Normally on her days off, she'll cook, but I'm doing all of that now, and since there are only a few things she can eat, I usually have to make something different for her than what we're happening. She usually tries to help with the cleaning, but since she's feeling so bad, I don't want her to, and she usually doesn't have the energy to do it anyway. Also, because of the person I am, I try to insist that she rest most of the time, and I wait on her for whatever she needs. Don't get me wrong, I'm not complaining. Under normal circumstances, I would walk to the ends of the universe for her, and now that she's carrying my child, I'd walk to the ends of the multiverse for her. I'm just saying that I've been even busier than normal lately, and I'm feeling quite tired, and I now have zero free time for fun...but it will all be worth it in the end, so I'd be an idiot to complain. We went for our second ultrasound today. The one we had two weeks ago was inconclusive, and there was a lot of worry that we'd lost the baby. 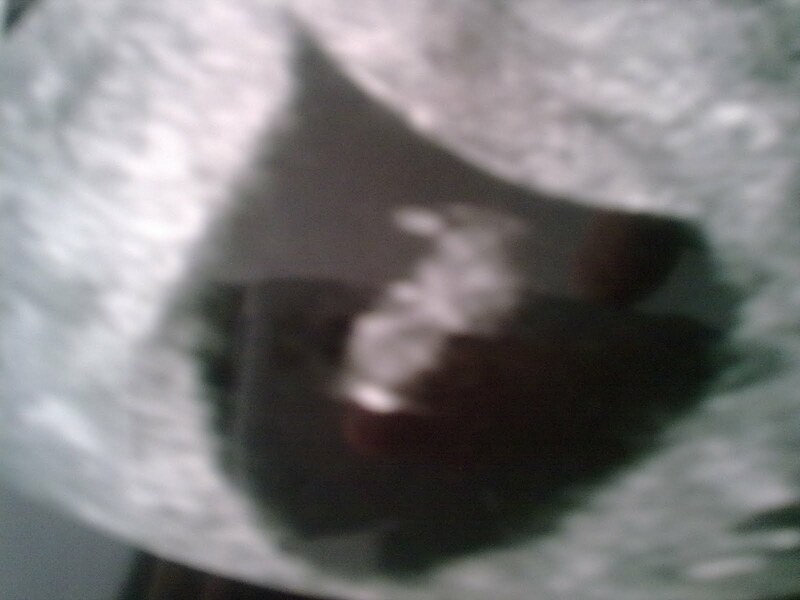 Today's scan, however, showed that everything is good, and the baby is developing just as it should. Although it was still too early to actually hear the heartbeat, we were able to see it. The last two weeks have been very stressful, and we're very happy to have a positive outcome on this one! As mentioned in a previous post, I will be speaking at the monthly DASFA meeting on April 17th. The event has had a change of venue. The meeting will be at the Broadway Book Mall at 200 S. Broadway in Denver. We did buy our rings, and we should have those in the next week or two. It's hard for me to imagine that I'm going to be wearing such an expensive piece of jewelery. I don't think I've ever worn anything that cost me more than $20...and this, this was definitely more. In order to stay on track, we still need to buy my suit and order the cake...luckily those aren't too time consuming, and hopefully we'll be able to find the time and health to take care of both of those next week. I just wanted to remind everyone that my flash fiction story "Nobody's Home" appears in the latest issue of Aoife's Kiss. Also, The Martian Wave issue 1, which I edited, is also now available. The zine focuses on the exploration and colonization of space...a subject that is very important to me. Both of these zines are produced by the fine folks at Sam's Dot Publishing. I originally had envisioned doing a short story collection centered around the crew of the Astrid. I wrote the first story, which appeared in Alternate Realities. Later, it was turned into an illustrated chapbook by Sam's Dot Publishing, and is still available from The Genre Mall. The second story appeared in Hadrosaur Tales. At that point, it was pretty obvious that I could combine the two stories, and then expand everything into a novel...and that's what I started doing. I've been through a few rewrites, but it's not quite there yet...but it is close. Since this is a space opera, I've even done a little bit of a work on a screenplay for it. Normally, my work doesn't really lend itself to a screenplay, but this story seems to scream out for dramatization. I've had a few queries about Mosi. She seems to be recovering. She's once again eating and drinking on her own, and she's starting to put some of the weight back on that she lost, and she's once again growling and hissing at Rebecca, so it looks like she's beaten whatever it was...at least for now. If it turns out that she had cancer or heart disease, there will still be more illnesses ahead of us. If it was just an infection or pancreatitis, then she should be good for a while. At least she'll get to celebrate her 11th birthday. My flash fiction story, "Nobody's Home," appears in the latest issue of Aoife's Kiss. When I first started writing the story, it wasn't supposed to be a flash piece. I'd envisioned a dramatic look at one man's struggle with loneliness in an empty world...what I got was something completely different. 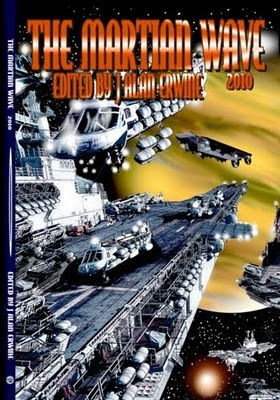 Since I first started editing...a long...long...long time ago, I've edited an on-line zine called The Martian Wave. Last year, Tyree Campbell (of Sam's Dot Publishing) and I decided to turn the on-line zine into a print zine, and we are now thrilled to announce that the first issue is now available. You can order it at http://www.genremall.com/zinesr.htm#tmw.